Sanjay Leela Bhansali has been searching for love all his life, at least on celluloid. Earlier, in smaller moments with Khamoshi and Hum Dil De Chuke Sanam, then taking an experimental turn with Saawariya and later in fully embracing star-crossed lovers in Devdas, and the Romeo-Juliet inspired Goliyon ki Rasleela Ram Leela. His latest offering Bajirao Mastani too tells the epic tale of a doomed love against the backdrop of a warring Marathas and rigid divisions along lines of religion which leave little room for love to flourish. Given the tide of growing intolerance in India, don’t look to this tale as salvation since the lovers only reunite in death. So much for the idea of a more syncretic past! Newly crowned Peshwa Bajirao (Ranveer Singh) makes a detour from his battles in expanding the Maratha Empire to fight and defend Buldelkhand against the Mughal onslaught. He falls in love with the Raja’s half-Rajput, half-Muslim daughter Mastani (Deepika Padukone), marries her and the rest of the film revolves around the friction this causes in both his stately as well as domestic affairs. So basically, a Peshwa version of shazishi saas, dusri biwi aur majboor shohar. Wherever have we seen that before? And that’s not all that we have seen before. Perhaps he is being self-referential but there is strong element within the props, staging and even dialogues that seem to be on repeat. Mastani shown embroidering brings to mind Sakina’s loom from Sawaariya. Even Sakina’s “Kabool Hai” dialogue is repeated here by Mastani. The towering candle lit pillars and linen curtains that showcase lovely light, and texture and were used to great rustic effect in Goliyon ki Rasleela Ram Leela are seen here too. The Dola Re female bonding song from Devdas is reincarnated as Pinga. Though Sanjay Leela Bhansali does do what he is best known for creating lavish set designs, opulence filled framesand magnificently choreographed songs. 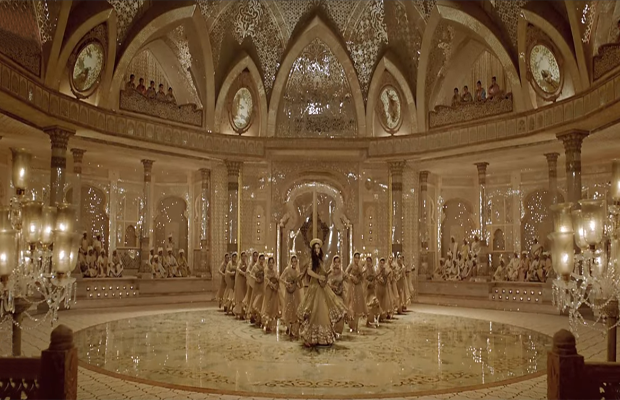 All that, and more is on display in the song Deewani Mastani, shot in the beautiful Aaina Mahal, which itself is a direct nod to Mugal-e-Azam’s Sheesh Mahal. This dazzling backdrop serves as a visual rejoinder to a story whose main focus seems to be beauty and a pleasing visual aesthetic. For a story whose crux rests on doomed romance, the sizzling chemistry between Deepika Padukone and Ranveer Singh which was leaping off the screen in Goliyon ki Rasleela Ram Leela seemed to be strangely missing. Though, they did get the doomed part right. 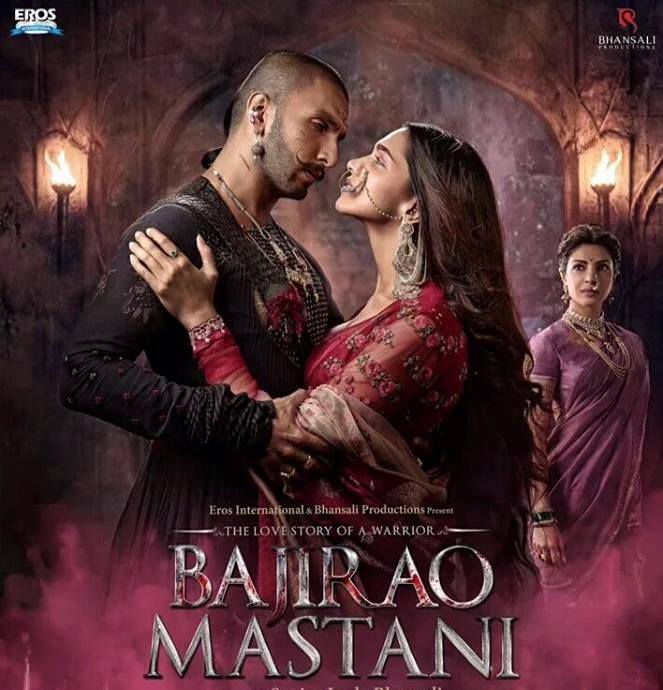 Majority of the screen play is devoted to the Peshwa clan’s refusal to accept Mastani as Bajirao’s second wife. His intimidating mother (Tanvi Azmi) shroud in widow’s whites cuts a terrifying figure and his brother (Vaibhav Tatwadi) too, never fails to humiliate Mastani. Behind their constant taunts of Mastani as dancing girl and concubine lie the very real discord and divide that religion and orthodoxy causes. The rigidity of their Brahminical household and practices recoils at accepting a Muslim woman as one of their own and taint their bloodline. With room to explore this idea of differences, and perhaps even come to an uneasy understanding, as Kashi Bajirao’s first wife does, all we get is one dialogue about how some people reduce the contours of religion to match the colours of saffron and green. Unfortunately the rest of the story line is what the drama universe has been peddling ad nauseam. As far as performances go, Randeep Singh bites into his meaty role with relish, even if he is playing a Brahmin. From political acumen to fearless warrior to the caring husband and helpless lover, he plays all the nuances of his character and maintains his Marathi accent and controlled body language throughout even into the off-key climax. Then again, Bhansali always gives ample space and time to his heroes whether in full body armour or in just their towels. They all get at least one song where they are front and center. Deepika Padukone looks ethereal and dreamlike in all those wonderfully over designed dresses by Anju Modi which are sure to cause a riot at the local darzis this Eid. Every carefully curated and coordinated outfit is to swoon for. However, she is merely coasting on her good looks. Though Mastani talks of eternal love and longing, there is very little soul to Padukone’s interpretation. She shows more gumption when she was fighting for her home and child, where clearly something was at stake. Worse though, were her terrible Urdu pronunciations which only heightened the clichéd and trite sounding Urdu dialogues. The person who stole the show from right under Deepika’s nose(rings) was Priyanka Chopra. 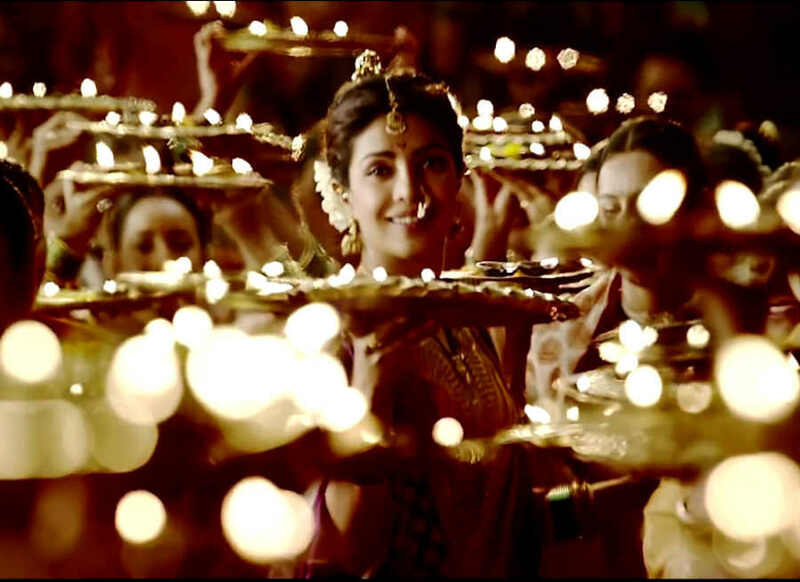 Her character of Kashi, Bajirao’s first wife was lovingly written and warmly enacted. Chopra’s pairing with Singh made for a refreshing change and there was a playfulness to their scenes which was lovely. Not only did Priyanka Chopra carry off her navaris (nine-yard saris) and naths with elegance, her child-like ways allowed her to be a little more believable, and she was able to add an aura of dignity to her pain and suffering as the wronged wife. It made me wonder how different the film would be if she played Mastani. The other actors Aditya Pancholi, Tanvi Azmi, Milind Soman, Mahesh Manjrekar and Vaibhav Tatwadi too put in formidable performances. There is much to be admired in the technical handiwork of the film. This is a vast improvement from Devdas’s boat ride against a decidedly cardboard-y background to Bajirao braving a tempest brewing storm to get to Mastani. Even some of the battle scenes despite a Crouching Tiger, Hidden Dragon hangover seem plausible. Sudeep Chatterjee’s fluid camerawork and play between light and shadows manages to capture the perfectly staged armies at war, and people at symmetrical repose. But major props should go to set and costume design which is the reason this film is a visual treat. But in the end, after all the smoke and mirrors, the opulence and visual excess if all you are left with is a shimmering image of the Aaina Mahal, you know that this epic failed to deliver. An edited version first appeared here. I read this on Images and was waiting to see the movie before commenting but alas my luck is definately out as far as movies go . I tried two theaters and was turned away , full houses everywhere.. knowing you and Sanjay Leela Bhansali This review is perfectly accurate . I knew Bhansali would be all gloss and given the current mood in India he wouldn’t emphasise the religious divide . But if he gets one person to think or consider by even this subtle nudges then I think its ok .
No one does spectacle better than Bhansali, so you will be in for a visual treat. Also interesting that he completely subsumed the part of her that was Rajput, just so that he could make a one-note point about her “muslimness’. Thanks for stopping by though, and welcome to the blogosphere.